You weren’t going to impress anyone with this. You may impress the bean counters at the accounting department by how miserly you were in your decision making, but no one else. 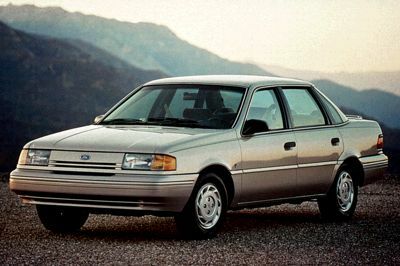 The 1994 Ford Tempo was the ultimate vanilla. It’s a camouflaged vehicle designed to blend you into the jungle of highways and commuters. It’s a car deserving of the most minimalistic of compliments such as ‘This thing has four wheels, some doors, and looks like a car.’ The name alone, tempo, suggests that this vehicle is ready to accompany you thru a steady life that’s never far from the ordinary. If you drove this you probably didn’t care about vehicle performance, being comfortable, or looking good in general. Or you drove this because you got to drive it for free, and there was no other option. This car was my dad’s and I learned how to drive in it. Perhaps the only compliment you can give is it is the perfect car to learn how to drive on. There was nothing in the interior to distract you from your driving activities. In the days before GPS and touch screen phones the only thing to distract you from driving is the sub-par tape deck and button-tastic HVAC controls on the dash. I don’t have any fond memories of this car. There was no love for this hunk of metal. There is the emotional attachment of it being the car that introduced me to the automotive world, however, it wasn’t an introduction one would expect given how awesome the automotive industry is. It’s kind of like getting too little pastrami in your reuben. This car was an all bread sandwich. Amongst the lack of memorable moments, I remember the poorly designed headlight system. To turn it on you pull on a plastic knob towards you, simple enough. However, whatever mechanical linkage that was behind the dash, which affixed this knob to the electrical system, was not impervious to heat and stresses incurred from repeated pulls. Pull too hard on this on/off switch and you would have discovered the third mode of ‘forever on’. That’s exactly what happened. The knob and the half melted shaft decided to free itself from the shackles of the dash and escaped with my hand. This Tempo now had a new feature of All-Time Running Lights. At this point there was no way to turn off the lights unless you disassembled the dash and re-attached the plastic knob, alternatively, you could disconnect the battery. So for a couple of days prior to taking it to the shop, the routine for driving was to first connect the battery and then turn on the ignition, and the reverse once you get to your destination. The only time this vehicle had any semblance of a sportier car was when the exhaust pipe started to corrode. Years of driving in America’s Nurburgring, which is the suburb of Baltimore County, Maryland, proved to be too much for the exhaust components. Once I took a jug handle exit and the centripetal force caused the muffler to get dislodged from the hangars and drag onto the asphalt. The sound of metal dragging on asphalt is deafening and panic inducing. This dragging continued until I exited the jug handle and entered the main road, at which point the scraping sound was suddenly replaced by a civic type-r-esque fart can buzz. Shocked at the sudden increase in performance and decibel level I looked back and discovered that the free hanging muffler has now released itself from the clutches of the rusted catalytic converter and tumbled down the road like a steel tumbleweed. Meanwhile, cars behind me swerved wildly to avoid wrecking into this tumbling mass. When not trying to kill others with its ejecta this car has tried to kill its own passengers, though it probably did so because the owner was not so diligent with the cleanliness of its interior. My dad has a poor habit of storing folders, clipboards, and hardcover books on top of the dashboard. Once after picking me up, he took a tight right turn and caused the loose items to shift and get lodged between the empty sections of the steering wheel. The positioning of everything, the wheel, the dash, and the falling clipboards and books was in perfect ‘Final Destination’ like arrangement that caused a lockup in the steering angle. This car was bound to go in circles indefinitely until it crashes with an oncoming car. After brief screams of horror and narrowly missing cars in the other lanes he was able to hit the brakes, effectively unlocking “The Club” made of self-help books and spreadsheets. In conclusion, this car isn’t perfect and it has the propensity to kill if you don’t treat it well. There really wasn’t anything memorable about this car. You’d own it for a good five years and then on to the junkyard it will quickly go. This car wasn’t going to win any beauty contest or any track days. If you ignore the mid 90’s american reliability, this car was the perfect option for the fiscally responsible and the emotionally absent. Regardless, this car taught me how to drive and it did so without frills, without art, and without emotion. Vanilla at its most vanilla.